Chef Yves Charles was frustrated with the poor quality of available table knives so he created his own. When Yves Charles was a Michelin starred chef in Paris he had some friends in for lunch. As the duck breasts arrived at the table guests pulled out their pocket knives to cut the meat. All of them owned the same pocket knife, the Perceval Le Francais. Charles, working on his duck with a disappointing table knife from the restaurant, asked why there isn’t a table knife as good as the pocket ones. So at the urging of his friends he went to Thiers, the knife capital of France, to work with Perceval to develop a table knife with the same qualities of their famous folding knife. The result: the Perceval 9.47 table knife, which can now be found in top restaurants around the world. The knife gets its name from the wine they were drinking with lunch, a not-yet-released wine with a 9.47 alcohol content, produced by one of the guests, Stéphane Majeune. Charles went on to buy Perceval and eventually run it full-time. 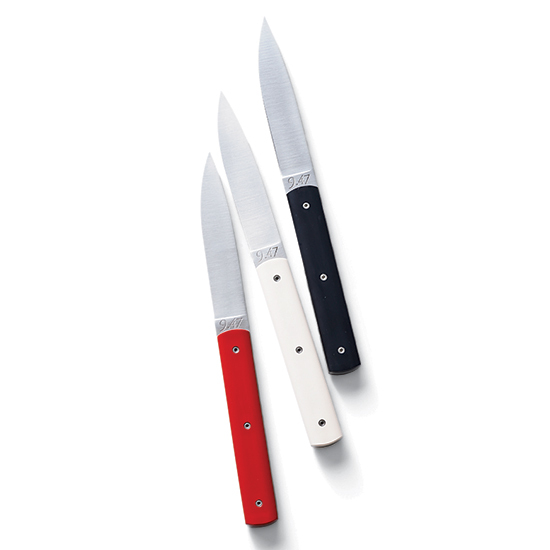 The knives are now availablein the U.S. for home cooks.